Once headquarters for the U.S. Army Training and Doctrine Command, Fort Monroe now is being redeveloped as a mixed-use community. The site’s history at Old Point Comfort on the tip of the Peninsula dates back more than 400 years to a fort created in 1609 by Jamestown colonists. The first Africans in British North America arrived at Old Point Comfort 10 years later. A star-shaped, stone fortress completed in 1834, Fort Monroe was deactivated as a military installation and designated as a national monument by President Obama in 2011. Today, the Fort Monroe Authority (FMA) oversees redevelopment of half of the fort’s 561 acres, while the National Park Service is in charge of the other half. In June, FMA issued a request for qualifications from companies interested in adaptive reuse of its buildings for hospitality, retail, mixed-use and recreational purposes. The redevelopment area includes four sites on 100 acres including 900,000 square feet of building space. By early August, the request had been downloaded more than 300 times. The deadline for companies submitting their qualifications and statements of interest is Oct. 11. Currently, 90 percent of the fort’s residential properties is occupied, as is 90 percent of its 100,000 square feet of office and flex space. More than 95,000 square feet of retail space also is occupied. The community’s businesses include two restaurants, a craft brewery and a 300-slip marina. Fort Monroe also is home to Liberty Source, which assists businesses needing backroom help. The company, which employs 200 people, has expanded several times since opening in Fort Monroe in 2014. It was drawn to the fort’s central location in Hampton Roads as well as its historical significance. The Virginia Marine Resources Commission has signed a lease for a 20,000-square-foot building that is being renovated. 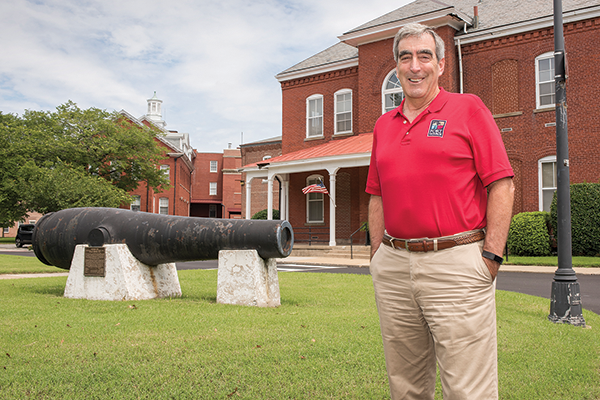 “We are also doing a $7.5 million renovation of the original Coast Artillery School Library and turning it into the Fort Monroe Visitors and Education Center,” says Glenn Oder, FMA’s executive director.